I did my first maternity shoot last Friday evening. We met in a park at 5:45 hoping to catch the golden light, but I hadn't anticipated the high trees, which blocked the low light. It also turned a bit hazy, so overall it was darker than I expected, and I had to shoot at 800 and 1600 despite being an outdoor, daytime shoot. Also, there were mosquitoes--the first of the year--so there was a lot of slapping and swatting going on. But, the good news is the family were great! It was my first time to meet them, but we hit it off right away. 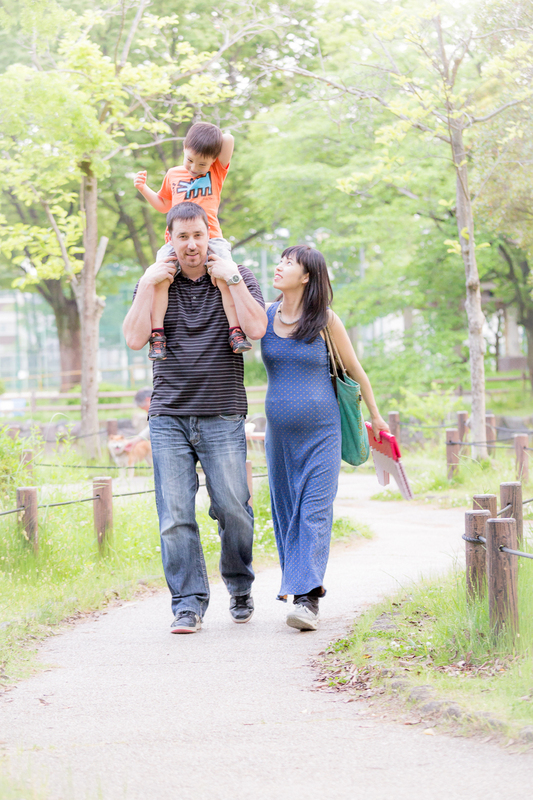 John is from Canada, his wife Manami is from Japan, and they have a four year old boy named Nolan. They were very relaxed and friendly, open to all my suggestions. Nolan got a little tired of the photo taking after awhile, so I made him my assistant. He helped me find locations, and checked my photos. It was nice to spend time with such a warm and friendly family, and Manami was a trooper, despite being almost nine months pregnant and having to swat away mosquitoes!